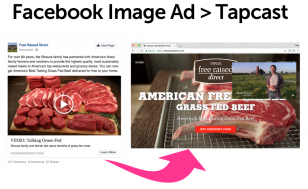 Use Tapcast Targeted VideoTM to play marketing and influencer videos picture-in-picture, in-context on your website and improve your conversion rates. Entice on your social channels. Engage and close on your website. Play the right video for the right audience at the right time. Experiment and optimize with ease. Place one line of code on your website and test and play an unlimited number of targeted brand-generated and influencer-generated videos on your pages with no more coding or IT support. 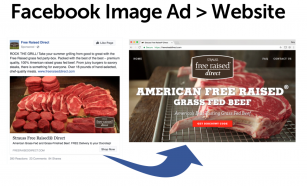 METHODS: 3-arm controlled study comparing two popular Facebook ad formats with calls-to-action that link to website versus a Facebook image ad that links to a Tapcast targeted video on website. 140,000 impressions, $3,400 ad spend. 1. Social video plays within a sea of distractions. Social feeds are a never ending stream of posts, videos, photos, ads, carousels, GIFs, and emojis from brands, influencers and friends. You want access to these huge audiences, but how do you focus the viewer’s attention on your message. 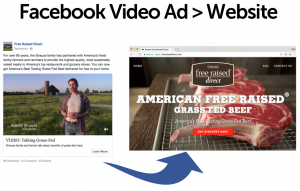 This study proves it’s best to move engagement and conversions from the feed to your website where viewers can watch your video in-context while interacting with your website. 2. Social video is disconnected from your website. Once viewers click on a website link or a call-to-action button (Shop Now, Learn More, etc.) from a social ad, viewers are taken to a separate experience on a website. Targeted video lets viewers watch your videos picture-in-picture, in-context on your website. This synchronous combination of watching and browsing keeps visitors on your site longer, which increases engagement and conversions. 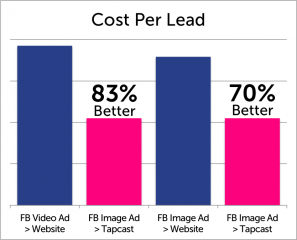 This study shows ads linked with Tapcast targeted video on your website increase conversions 70-270% and increase website engagement 2-3X. 4. Embedded video is inflexible and requires coding. Embedding video is a popular tactic to connect video and a website. Generally a video is embedded on a fixed location on a homepage. Occasionally videos are embedded on product pages. In all cases videos are associated with one part of page and when the viewer browses to a new page or different points on a page, there is disconnection. 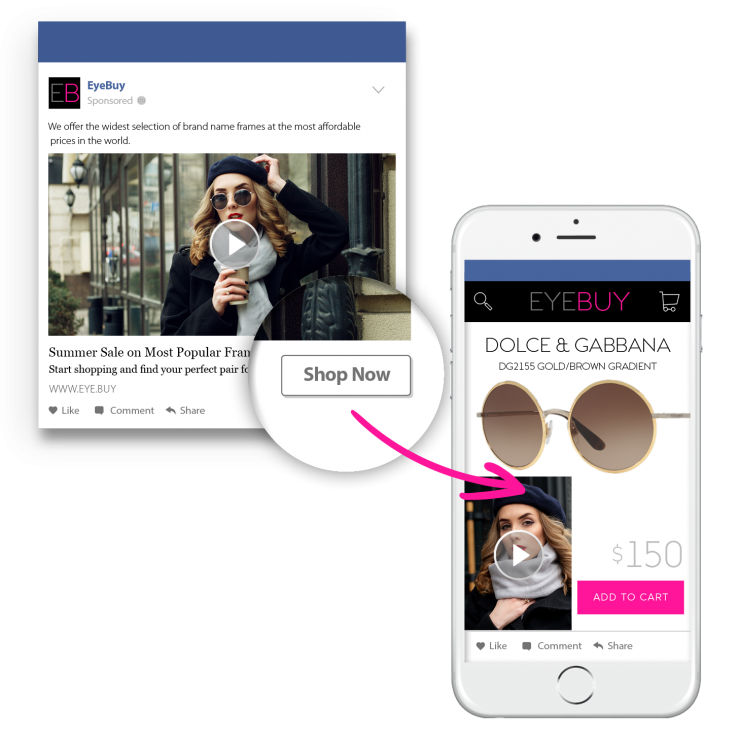 Moreover, embedding locks you into one video in one location for all target audiences and all ads. Marketing and creative can’t embed videos without coding so experimenting and optimizing are difficult. 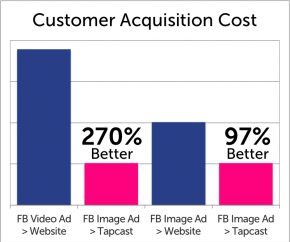 With Tapcast, marketing and creative folks can experiment and optimize as much as they want. They can use multiple videos on any page, link any video with any target audience and link one or more videos with any different actions with zero coding or IT support. Tapcast gives marketing and creative teams full control of the video/web experience. Today’s consumers expect a rich content experience as part of their discovery and decision making journey. Video reigns supreme. Get more from your marketing videos by letting viewers watch your videos in-context on your website outside the sea of distractions of the social media feed. 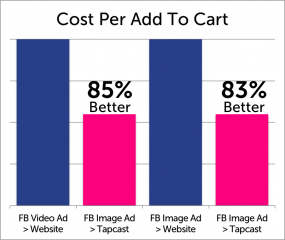 This study proves Tapcast can keep people on a website longer and increase key eCommerce metrics, including cost per lead, cost per add to cart and customer acquisition cost. Multiply the Power of Video.